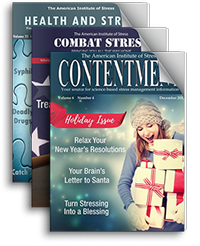 From time to time the Editor of Health and Stress interviewed leaders in the field of stress management on a variety of topics for inclusion in our publications. Some interviews are listed below. This interview by Paul J. Rosch, M.D., F.A.C.P is highlighted as a special edition in the October 2012 issue of Health and Stress. This interview by Paul J. Rosch, M.D., F.A.C.P is highlighted in the August 2010 issue of Health and Stress. This interview by Paul J. Rosch, M.D., F.A.C.P was included in the October 2003 issue of Health and Stress. This interview by Paul J. Rosch, M.D., F.A.C.P was included in the June 2004 issue of Health and Stress. This interview by Paul J. Rosch, M.D., F.A.C.P was included in the September and October 2005 issues of Health and Stress. This interview by Paul J. Rosch, M.D., F.A.C.P was included in the April 2005 issue of Health and Stress. This interview by Paul J. Rosch, M.D., F.A.C.P was included in the August 2007 issue of Health and Stress.